As you can guess from the title of Simon’s Cat in Kitten Chaos, in the latest addition to the wonderful world of Simon’s Cat, a kitten has joined the household. Kittens are wonderful things, so playful and inquisitive, and always hilarious with their antics. But of course Simon’s Cat is not too impressed with this cute new housemate – the kitten grabs Simon’s attention easily, and refuses to learn to behave as a dignified cat should. The Simon’s Cat cartoons are the creation of Simon Tofield. From the first video on YouTube, cat lovers around the world were hooked. He perfectly captured the feline nature, with perhaps a touch of exaggeration. Anyone who had ever known a cat could see that cat in Simon’s Cat. The cartoons are simple black and white line drawings, which are very effective. The simplicity of the drawing allows the humour to be conveyed that much more clearly, with the jokes being almost immediately apparent. The humour is very realistic; every page has Simon’s Cat or the kitten in a scenario you can easily picture your own cat getting into. Every page had me at least giggling, but often laughing out loud. Simon’s Cat is an average cat. He has adventures in the garden, steals Simon’s chair, walks over his laptop…things that we can all recognize and give a wry smile at. The kitten, however, changes things. She can make Simon’s heart melt in seconds, but when Simon’s Cat tries the same thing, Simon isn’t impressed. She watches Simon’s Cat on the litter tray, which is really not acceptable cat behaviour. Simon’s Cat eats all her food then looks baffled as Simon praises her for finishing all her dinner. I’ve loved Simon’s Cat since the first time I saw the cartoon of him trying to wake Simon in the morning. He’s a simply drawn but very cute cat. The kitten is (dare I say it) even cuter. My favourite drawing in Simon’s Cat in Kitten Chaos is a very simple one and not even a real laugh-out-loud cartoon – but it’s adorable. The kitten is curled into a tiny ball in the middle of Simon’s bed, fast asleep. Simon is watching and looking like a man in love, while telling Simon’s Cat not to disturb her – as Simon’s Cat wriggles and squirms in his arms. There’s something about a sleeping cat, and especially a sleeping kitten, which just makes me say awww – it happens numerous times a day in my house. While we may now expect hilarity from Simon’s Cat, the cartoons have lost none of their delight as Simon’s Cat has grown in popularity. Simon’s Cat in Kitten Chaos will make you smile and laugh just as much as the first book did. 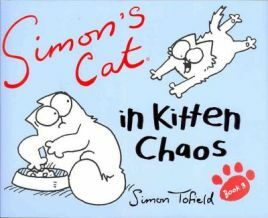 No Comments on "Simon’s Cat in Kitten Chaos"